On 15 October 2012, Time Warner Cable started charging a separate rental fee for its cable modems of $3.95 per month. 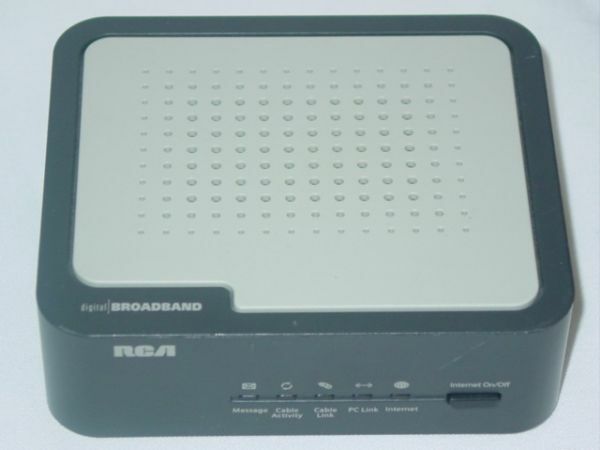 Prior to that date, the cable modem fee was bundled into the cost of the service, providing a customer with little reason to purchase a modem on his or her own. Time Warner Cable deploys 40+ different modems, but is authorizing only 5 for my level of service. 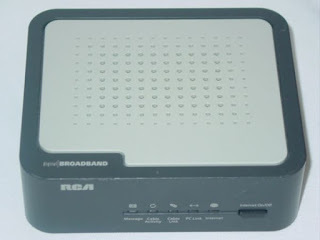 The modem that they supplied me, a Turbo customer, was the Thomson/RCA DCM425. This is a DOCSIS 2.0 unit which retails for about $50. At that purchase price, the breakeven on $3.95 per month savings in rental fees is just over 12 months -- a hell of a return (a simple IRR about 87% annually if the modem has a 4-year life -- actually better than that since the savings on the modem are doled out each month rather than at the end of each year and better still if the rental price of the equipment goes up, which would not be without precedent in the annals of the cable industry -- IRR calculations are available here). 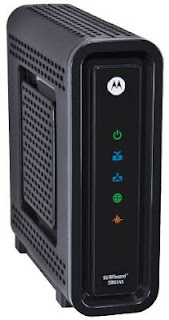 However, the least expensive modem that they will authorize for my level of serviceis a Motorola SB6141. This modem meets the DOCSIS 3.0 spec and represents the latest commercially available cable modem technology. This modem would cost about $115. That return is about 23% annually if the modem has a problem-free 4-year life. I also learned from TWC tech support that the "Turbo" service, while not requiring a DOCSIS 3.0 modem will actually work faster with such a modem. The DOCSIS 3.0 modem would also work with any higher speed service which is something I have considered getting. The differences between the DOCSIS specs mainly boils down to the fact that the 3.0 modem is more future-proof than the 2.0 modem. Hmmm, what one would really want is for TWC to rent the DOCSIS 3.0 modem for $3.95. I went to their store and asked for just that. No dice. TWC's rep would only give me a new version of the same Thomson/RCA modem I had. When I got it home, it worked exactly the same way the old one did. About 16 Mbps downstream and 0.7 Mbps upstream. I did like the idea of faster service and, 19% annually is a lot better than my portfolio typically yields. After waiting for the early purchasers to get through the system, I found a new Motorola SB6141 from a well-regarded eBay seller which I won at auction for $97.50. I connected it and got it authorized by TWC over the phone in about 5 minutes on a Saturday morning. I did have to wait about 40 minutes to return my old modem to TWC at their store. Going to their store at 11AM on a Saturday is not recommended. Bottom line: My downstream speed is now about 19 Mbps (a figure I got on occasion before, but not regularly) and my upstream speed is now about 2 Mbps (a figure way better than I ever got before). If my modem lasts 4 years, it will give me a return of about 33% annually and provide performance call it safely ~10%+ better than I was getting. That's a good deal provided that the risk of failure of the modem is modest. How did TWC do? On the downside: TWC sprung a fee on their customers on 2-weeks notice, they required the purchase of more expensive equipment than they provide themselves and made me wait 40 minutes simply to return something to them. On the plus side, the authorization couldn't have been easier. It wasn't the greatest performance by a cable operator, but it was adequate. I thought that I would put a bit of a finer point on the benefits to AMC in the Dish settlement over the Voom matter. Rich Greenfield of BTIG Research did a nice job on his blog of breaking down some of the carriage benefits that AMC Networks gained (reg. req'd), I wanted to take his analysis a step further. Based on my experience, the middle package probably does better than 2/3 and the bottom package does worse than 1/3, but I'll use these figures to keep the analysis simple. When the services were dropped, AMC, IFC and WeTV were all carried in AT200. The services were all relaunched in AT120. A service like AMC which is fully distributed across the multichannel universe, is typically valued at $25 per subscriber; less-than-ubiquitous services like IFC and We TV valuations are typically lower, say $15 per subscriber. In aggregate, the asset value increase in distribution could be worth ~$230 million to AMC Networks. Additionally, Dish agreed to launch Sundance Channel, which Dish previously only carried on a likely-thinly-penetrated Blockbuster-branded Internet-delivered package, on AT250. Throwing that in at $15 per subscriber adds another $60 million or so in value. Additionally, Dish agreed to launch Fuse, a service not owned by AMC Networks, but by the commonly controlled Madison Square Garden Company (MSG), in AT120. Fuse, for those unfamiliar with it, is a not-very-highly-rated music service comparable to MTV before it was remade as a reality service. Dish had a bit of a tortured history with Fuse, having dropped the channel in July 2010. Valuing this distribution at $15 per subscriber, there is another $190 million in value. That is not the end of the benefits that MSG got in the deal as Dish also dropped its FCC program access complaint against MSG regarding the MSG and MSG Plus regional sports networks (which control the local rights to the NBA's New York Knicks and the NHL's New York Rangers, New York Islanders, New Jersey Devils and Buffalo Sabres). This complaint dated back to September 2010. It is difficult to put a price tag on making this complaint go away. but it is certainly a benefit to MSG. While it would have been a better outcome for MSG to regain the distribution of its regional sports networks, eliminating the risk of an unfavorable program access complaint has value in reduced legal fees and eliminating a potentially damaging precedent that could be cited by other distributors. It will be interesting to see how much MSG's shareholders are compensating AMC's shareholders for these benefits; that disclosure should make it into the companies's annual reports, since the benefits fall in the fourth quarter. In short, IFC, WeTV and Fuse would never have ended up in Dish's AT120 in the ordinary course of business. Given the acrimony between the companies, it is also far from the ordinary course of Dish's business to launch Sundance and Fuse. While many believed AMC Networks did not do well in the Voom settlement because they had requested $2.5 billion in damages, the trial appeared to be going all AMC's way and the settlement payment of $700 million was below the $1 billion expectations, perhaps the financial analysts should take a closer look at the details. Given the very favorable (for AMC) settlement of the services's packaging, it is my opinion that AMC probably did pretty well on the license fees for the services as well. These precedents add value to AMC Networks directly, but also create precedents that AMC can use to demand more from smaller multichannel distributors, and everyone but Comcast and DirecTV is smaller than Dish. There can be tremendous value in favorable cable network distribution agreements. Since the Voom Settlement Agreement and the multi-year affiliation agreement were entered into contemporaneously, we accounted for all components of both agreements at fair value in the context of the Voom Settlement Agreement. We have determined the fair value of the multi-year affiliation agreement and the MVDDS Licenses using a market-based approach and a probability-weighted discounted cash flow analysis, respectively. Based on market data and similar agreements we have with other content providers, we allocated $54 million of the payments under the multi-year affiliation agreement to the fair value of the Voom Settlement Agreement. Evaluating all potential uses for the MVDDS Licenses, we assessed their fair value at $24 million. The fair value of the MVDDS Licenses will be recorded during the fourth quarter 2012. The Voom Settlement Agreement is considered a Type I subsequent event and our $730 million estimated fair value of this settlement is recorded as “Litigation expense” on our Condensed Consolidated Statement of Operations and Comprehensive Income (Loss) for the three and nine months ended September 30, 2012. Additionally, $676 million and $54 million are recorded on our Condensed Consolidated Balance Sheets as “Litigation accrual” and “Accrued Programming,” respectively. The resulting liability related to the multi-year affiliation agreement will be amortized as contra “Subscriber-related expenses” on a straight-line basis over the term of the agreement. The rates in the middle of this list are not far from the market rates for Fuse. Perhaps Dish is looking at the Fuse agreement alone as the source of this "excess payment". Note that in its disclosure of the settlement, AMC referred to the affiliation agreement as "long term". By the standards of the cable TV industry, that suggests a term of at least five years. Given the very favorable carriage of the AMC networks (and Fuse), a long term commitment for that carriage would be more valuable to the programmer than a rate premium. Updated 8 November 2012: AMC Networks reported its 3Q12 results today. In its press release, there is no mention that AMC received any consideration from MSG for AMC's part in gaining carriage on Dish for MSG's Fuse service as part of the Voom settlement. Updated 7 December 2012: The Madison Square Garden Company reported its 3Q12 results on 2 November 2012. In its 10-Q, there is a single sentence on page 22 about Fuse: "Dish Network LLC resumed carriage of Fuse on November 1, 2012 pursuant to a long-term affiliation agreement." There is no mention that MSG provided any consideration for AMC's part in gaining carriage on Dish for Fuse service or that such carriage was part of the Voom settlement. It seems that the MSGC shareholders got this benefit from the AMCN shareholders at no cost, which doesn't seem quite right. My earlier post on this dispute.